Mental health is a serious label in modern society but writer P.J. Hogan successfully manages to de-stigmatise the label in his latest comedy, Mental starring Toni Collette, Liev Schreiber, Anthony LaPaglia and an overweight Rebecca Gibney who looks totally different than her character in Packed to the Rafters. Directed by P.J. 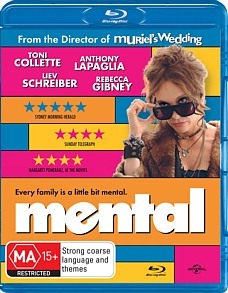 Hogan who also directed the iconic Muriel's Wedding, Mental is a similar comedy with its Australian quirkiness and good girl bad girl characters. It's a well-written comedy with some great "aussie" characters about being normal, love, life and death. The story is set in a fictional suburb of Queensland and focuses on the chaotic lives of the Moochmore family, more specifically their five teenage girls who all believe that they have some sort of mental illness. To compound their situation, their mother Shirley has "another" nervous breakdown which results in her singing songs from the Sound of Music to make her life seem more colourful than it really is. With their mother sent off to "Wollongong" which is a cover for a mental institution, their wayward and womanising father (Anthony LaPaglia) who is also campaigning to become Mayor again hires a hitchhiker from the street called Shaz (Toni Collette) to look after his children. It seems that mental attracts mental and Shaz immediately bonds with the girls as she teaches them that normal does not exist in the real-world which results in their self-esteems to increase and for them not to care what others think as everyone has their own issues. However Shaz has her own dark secrets and unbeknown to the family, she lost a daughter to suicide many years ago and her ex-husband Trevor Blundell a shark hunter (Liev Schreiber) may have been responsible. Eldest daughter Coral (Lily Sullivan) introduces the film well when she recounts the time she tried to commit suicide by jumping off their balcony, only to land on her father's car which knocked him out. It's classic P.J. Hogan humour. Although Mental does not quite get to the heights of Muriel's Wedding, it is still a feel good Australian comedy that is quite cleverly scripted and helps remove the stigma from mental illness. There are some brilliant standout performances in the movie, especially by Gibney as Shirley Moochmore, Lily Sullivan as Coral Sullivan who plays the oldest daughter of family and blossoms into her own character thanks to the exploits of Shaz. Lastly we have Toni Collette who plays a powerful female character that does not take "what... or no" from anyone. Commendations should also be made to Liev Schreiber, an American who manages to perfect the Australian accent and Deborah Mailman (The Sapphires) who plays an indigenous lesbian who has some great scenes in the film, especially with the neurotic neighbour and her daughter. With that said, all the characters in Mental, especially the girls of the Moochmore family are great characters which force you to smile whenever they are on, for they generally have something strange to say or do. Like Michelle Moochmore (Malorie O'Neill), one of the sisters who believes aliens are stalking her for the mental man. Priceless! Video quality is exceptional on Blu-ray as are the audio tracks, thanks to the DTS HD 5.1 track. The video quality is crystal clear in this movie, especially the colours that are vibrant and quite colourful. Special Features are a little limited with just cast & crew interviews. Nonetheless Mental is a fun movie from start to finish!